Please be informed that, there will be an event on 17th International Exhibition on Worldwide Food & Beverages, Technologies and Machineries on 2nd – 5th August, 2017. 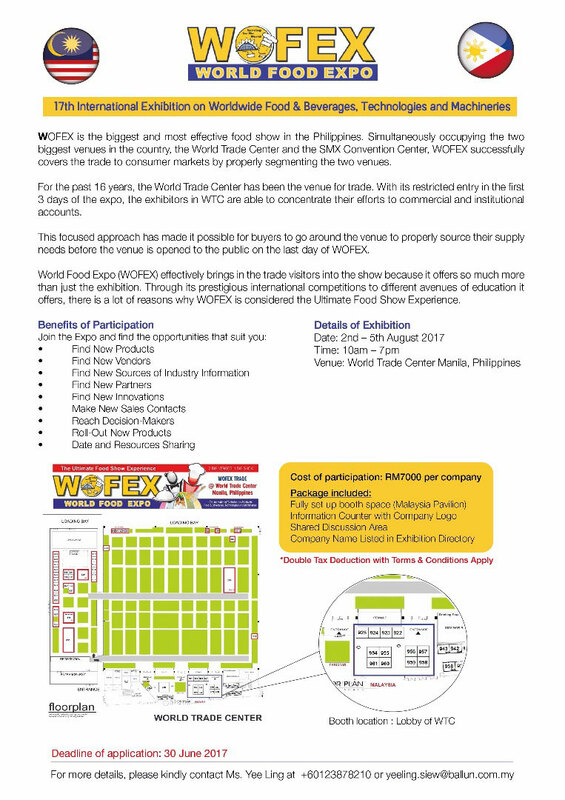 World Food Expo (WOFEX) is the biggest and most effective food show in the Philippines. Simultaneously occupying the two biggest venues in the country, the World Trade Center and the SMX Convention Center, WOFEX successfully covers the trade to consumer markets by properly segmenting the two venues. For further information or registration, kindly visit our website: http://smeam.org/ of contact Ms. Yee Ling (+6012-3878210) or email: yeeling.siew@ballun.com.my.